Whole grains provide healthy benefits when added to your daily diet. The Whole Grain Council recommends that at least half of your grain intake should be whole grains. Medical evidence shows a reduction in the risk of heart disease, type 2 diabetes, obesity, stroke and cancer associated with the consumption of whole grains. 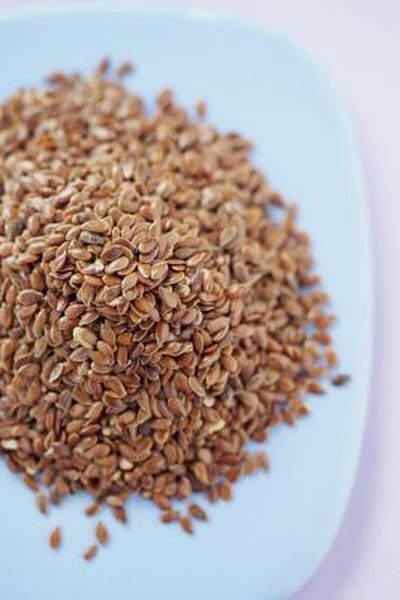 Flaxseed is one of those whole grains, and wheat germ is a vital component of whole grain wheat. Flaxseed is a good source of fiber, lignans and omega-3 fatty acids. Lignans belong to a group of plant chemicals called phytoestrogens because they have possible estrogen receptor properties. The omega-3 in flaxseeds comes from its alpha-linolenic acid, which is a precursor for omega-3 fatty acid. Flaxseed is a whole grain that is available both whole and ground. Two tablespoons of ground flaxseed contain 4 grams of fiber and approximately 74 calories; whole flaxseeds contain 5.6 grams of fiber and 110 calories, according to the U.S. Department of Agriculture Nutrient Data Laboratory. Whole wheat grain is made up of three vital parts -- the endosperm, the bran and the germ -- that are separated during the milling process. Wheat germ accounts for only 2.5 percent of the wheat kernel, yet it contains the embryo of the seed. This is where the newly sprouted wheat will germinate, hence the name "germ." Two tablespoons of wheat germ contain approximately 50 calories, 4 grams of protein, 2 grams of fiber and 1 gram of fat. It is also a good source of B-complex vitamins and folate, according to the USDA Nutrient Data Lab. Wheat germ is easily added by the spoonful to hot cereal, smoothies, yogurt, fruit salad and vegetable dishes. It can be added to recipes for breads, muffins, pancakes and waffles. There is a toasted variety and a raw wheat germ. You can use flaxseed whole or grind it and add it to the same foods as wheat germ. One tablespoon of wheat germ or 1 tablespoon of ground flaxseed can be added to these dishes as well. If you want to use larger amounts, follow a recipe. Wheat germ does not have a long shelf life due to its fat content. Store it in the refrigerator in an airtight container and use before the expiration date. Flaxseed is similar because it is a good source of omega-3 fatty acids, also a type of fat. Once you grind it, either use it or store in the refrigerator. Do not use flaxseed or wheat germ that is old, as the fats can become rancid. Wheat Foods Council: What is Wheat?